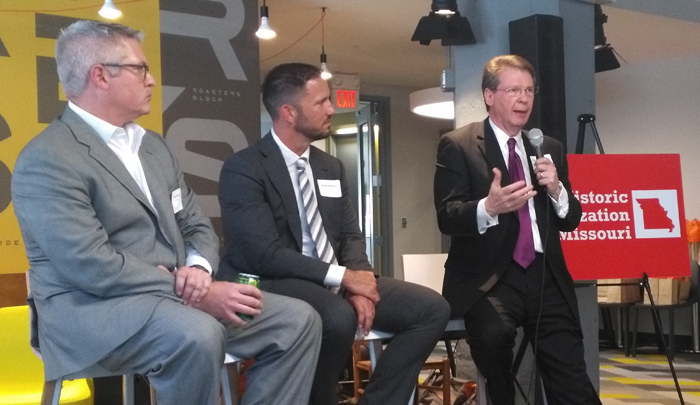 Over 60 community leaders, real estate developers and members of the business community gathered Wednesday night at the Roasters Block in Kansas City to discuss the state of historic tax credits in Missouri. Panel members were former mayor of St. Louis Vince Shoemehl, Jim Farrell of Historic Revitalization for Missouri, and Spencer Fane attorneys David Schatz and Shawn Whitney. The panel was moderated by Spencer Fane attorney Nate Orr. Panel members discussed how historic tax credit financing is being used to restore historic buildings and aid economic development throughout the state, and how proposed legislation may affect those tax credits. Panel members then took several questions from the audience. Attendees were entertained by the band Gypsy Fingers and were able to tour the Roasters Block, a historic building in the heart of downtown Kansas City that was formerly a Folgers Coffee manufacturing facility. Thanks to historic tax credit financing, the formerly abandoned building has been renovated into a state of the art apartment complex. Historic Revitalization Missouri is an advocacy group working to gather factual based information for legislators and committee members on the subject of historic tax credits.